On 26 September 2014 the Third phase of joint EU/UNDP Project “Community Based Approach” was officially launched in Kherson oblast. The presentation took place during regional seminar under participation of UNDP in Ukraine Senior Programme Manager Oksana Remiga, Community development specialist of EU/UNDP Project “Community Based Approach” Olena Ruditch, leadership of Oblast State Administration, Oblast Council, heads of rayon state administrations and rayon councils; and heads of village and city councils. 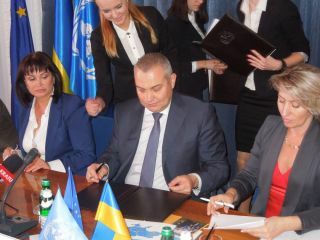 During the launching of the Third phase of the CBA Project a Partnership Agreement was signed with Kherson oblast state administration, Kherson oblast council and UNDP. The main goal is the willingness of local communities and local authorities to implement the community based approach in a full-scale. In terms of the agreement 8 rayons will be selected based on the results of a competition for participation in the project for the next 4 years. The Application form can be found: http://www.cba.org.ua/three/ua/news/announcements/2616-application-form-for-rayons-for-partnership-with-cba. Participants of the regional seminar discussed the Project role in a social and economic development of the region and encouragement of community initiatives on a local level. 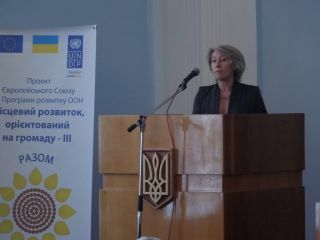 Oblast authorities and UNDP in Ukraine Senior Programme Manager Oksana Remiga outlined priorities of further cooperation in Kherson oblast. Third phase of the Project will support local authori ties in dissemination of best practices and experience in participatory planning and further dissemination of the community based approach in Kherson oblast. The Project activities will focus on rehabilitation of social and communal infrastructure in the area of energy efficiency, health care, environment, water supply, rural economy. 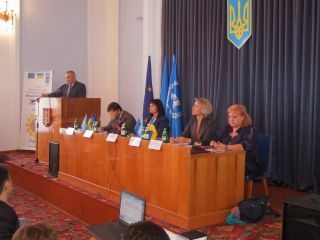 Implementation of the first phase of CBA Project commenced in Kherson region during May 2008. First phase was succeeded by a second phase in July 2011. Over these two phases, 107192 men, women and children of the region have benefitted from improvement in 62 schools/kindergartens, 17 healthposts, 19 water supply, 6 street-lightning and so on. This happened through joint effort of the citizens, oblast/rayon/local level governments, CBA Project and the private sponsors.